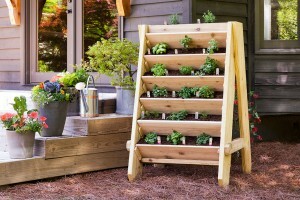 So you want to create your own vertical herb garden / herb wall? You’ve probably seen some of the more interesting personal gardening creations on the internet already – back patio herb gardens which arrange the plants in a near vertical fashion, thereby saving space while also looking somewhat chic as well. Clearly they’re extremely handy, allowing you to have fresh herbs ready at a moment’s notice, literally within reach of the kitchen, so to speak. Of course most people assume that you might need to go to your local hardware / gardening emporium in order to pick up some specialized equipment to set such a thing up. While it’s true that you could do that, but why not actually just build your own? In fact, you might even be able to construct a fine-looking system from the random bits of refuse you tend to get rid of each week. First things first, you’ll need to create something to actually store your containers in. Naturally, before you can jump ahead and start to figure this part out you should have already decided upon which style of installation you’re interested in creating. Assuming that you’re really interested in the overall look of your portable herb garden, a wood frame / body is going to be recommended. Again, don’t assume that you’re going to be able to find (easily or cheaply) a suitable piece that can fulfil this role though, it’s better to just build it yourself so that you can rest assured that you’re getting exactly what you want. The example below is perhaps one of the easiest types of installations to build, although it won’t be portable unless you stick everything into some type of rolling bed (which is certainly doable, just be sure to secure the sides and back so there’s no sliding around). 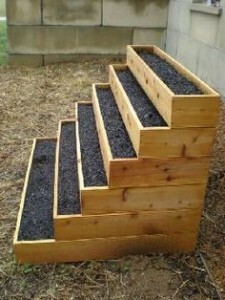 It essentially takes on steppe farming-style look, with each subsequent planting area being located on its own separate “stair”. If you go this route, you can actually fill up the non-usable areas (like the “back” of each “drawer”) with rocks or something substantial. You might also opt to create an “easel-like” design / frame out of wood, which also works quite well and helps to get things off and away from the ground. Obviously, this takes a bit more wood crafting and perhaps carpentry experience to pull off, but the overall look it affords when finished is definitely going to compliment any backyard garden, etc. 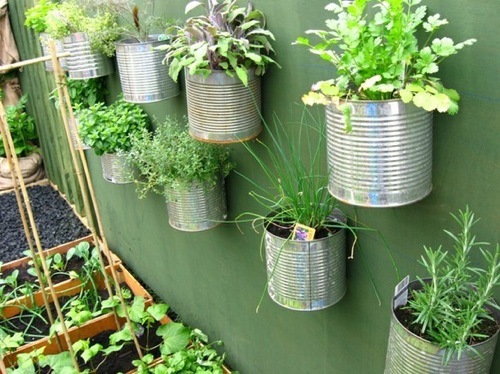 Arguably, one of the most modern and attractive methods of constructing an herb wall / garden is to seek out and use found materials in the overall construction. With this you virtually anything can be implemented to some useful end – including empty 2-liter soda bottles, cans, etc. (See examples below). 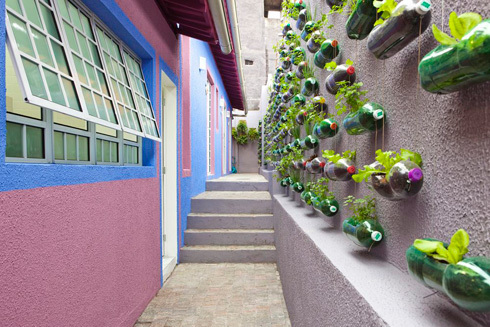 Your imagination is basically the only limitation here… A lot of people will actually just set up a wire fence, cut off the bottoms of each bottle, add soil to each drinking container, and then stack them inside one another. If there’s room on the side for the plants to stick out and they’re secured to the fence, in a short time you’ll have a cornucopia of herbs sprouting out in all directions. Moreover, if you’ve added some tubing inside, or have opted to stick multiple bottles inside each other, irrigation and watering is also greatly simplified. Quite obviously this is probably the preferred method out there, especially since it can be done so cheaply, works very well and even looks rather spiffy too. Moreover, you’re not limited to any one particular type of support structure with this and can basically attach bottles or containers to nearly anything you can think of. …have an old “shoe organizer” you no longer use? 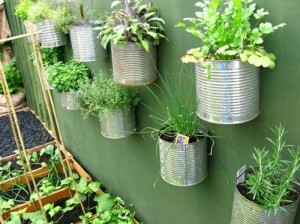 Turn it into an herb garden container. You don’t just have to plant the classic herbs in your garden, like rosemary, cilantro, thyme, basil, chives, sage, tarragon, parsley, lemon balm, etc., you can also stick in some run-of-the-mill crops too. Tomatoes, lettuce, peppers, and more will also thrive in a vertical garden like this (just be sure to make it sturdy enough to handle the extra weight if you do end up using it for larger yields). As always, have fun and here’s hoping you get some great gardening done.